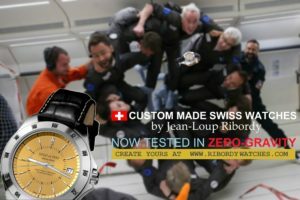 Ribordy Watches tested in Zero Gravity! We are very happy with the results of this unusual test, the watches have performed very well showing perfect time keeping before, during and 12 month after the flight without change of battery and any maintenance! Tests taken place in Bordeaux (France) with thanks to Avico company and European Space Agency that runs Zero Gravity flights. We are happy to announce that we have added new dials, straps and hands design options to our Swiss Made Custom Watch configurator. Our IT team also upgraded configurator engine and it now should work without errors on all smartphone, tablets as well as PC's and Apple. 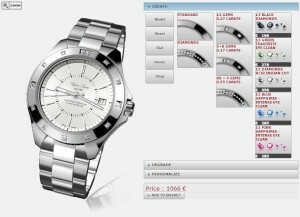 We invite all site visitors to try out new designs on create your own watch page. The well-known custom Swiss made watches brand Ribordy Watches has acquired popular Internet Forum. The Brand plans to launch it's own Forum using existing Custom Watches Forums' platform. Ribordy's spoke person said: "There are plans to let users post their own pictures and reviews of Ribordy Watches. Also some of the current topics such as reviews or other brands' watches will remain at place. We believe it will give the opportunity to all users to exchange honest reviews about Ribordy Watches and other brands as well as will give an idea of potential designs to all new our clients". The Swiss custom watch brand Ribordy Watches, by watchmaker and designer Jean-Loup Ribordy, has been voted the Custom Watch of the Year 2016 by members of a specialist online forum. The voting took place over several weeks and each forum member could cast just one vote for their favorite custom watch brand. Among the nominees were well-known brands from countries around the world, specializing in personalized and custom watch making. Swiss PL and Swisscustomwatches Co. took second and third places respectively. 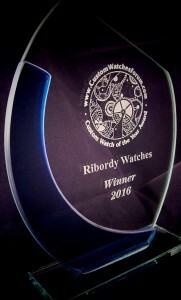 The vote’s winner, Ribordy Watches (www.RibordyWatches.com), has been awarded with a memorable trophy as seen in the photo. The well-known Custom Swiss-Made watches by Jean-Loup Ribordy feature a new option to encrust their bezels with gemstones — a striking new design feature added by the quality watchmakers in their online configurator. In addition to the white or black diamonds (SI-2 clarity), green tsavorite or pink and blue sapphires can now be customised to embellished the watch. Jean-Loup Ribordy anticipate that this addition will attract interest for the Swiss-Made watch among women. personalised with the engraving of your name on the dial, are particularly popular in the United States, United Kingdom and Arabic countries. The watch constructing configurator on their website, www.RibordyWatches.com, in which a client can build their own watch design and customise it with their name and optional message, has recently undergone improvements in its compatibility with Apple iPad and Android Tablet devices. For its corporate clients, Jean-Loup Ribordy suggest the option to opt-out of the “Made by Jean-Loup Ribordy” mark on the bottom of the dial, so as to allow for the creation of their own corporate-branded Swiss-Made watch. The Jean-Loup Ribordy watch constructing configurator has won awards for best website feature in 2004. All previous releases have been archived.